Our most ultra-secret game. Our Chibi Dolls & Party attendants were our "Beta Testers"
So, you want to play? 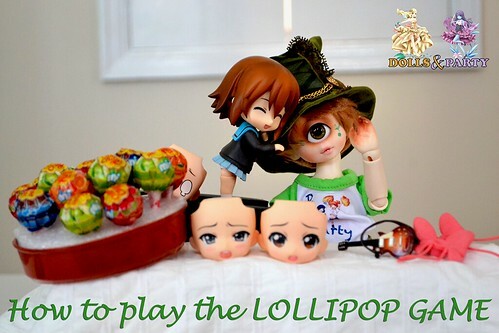 the Lollipop Game at Dolls & Party! The Lollipop game is very simple! You will be presented with a lot of Lollipops. Choose one. Choose carefully and unstick it off the base. Now check the stick. If it is painted… You have a prize! You can get Lucky Clovers! Lucky Clovers will be given to you when you purchase 25 euros from any of our exhibitors (Dolls & Party and events not included). Sweet Tooth rule: You get to keep your non-prized lollipops! Enjoy them! What if a Prize is not won by anyone? For those Prizes that after the Dolls & Party still stay with us do not fret, as they will become available again for the Chibi Dolls & party this Autumn.